You may receive an error when attempting to connect to the Inegration Server (VIIS) if you have not changed the default connection data. 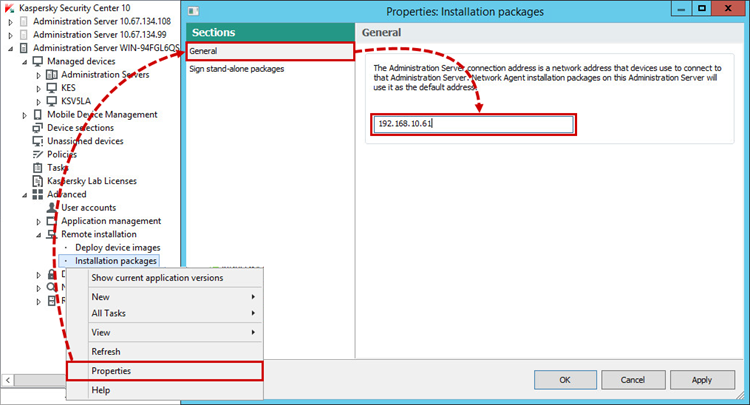 The Integration Server address should be specified in IP or FQDN format and cannot be localhost or 127.0.0.0. In most infrastructures the Integration Server and Administration Server are installed on the same computer. Therefore, by default, Kaspersky Security for Virtualization 5.x Light Agent fills the field in the interface with the data for connecting to the Integration Server from the Administration Server settings. This data might not be in the correct format for connection, for example, when installing the Administration Server on a computer outside the domain. Make sure that the Integration Server address is specified in IP or FQDN format. To prevent this connection error from occurring again, set an address for the Administration Server that will conform to the correct Integration Server address format. Go to Advanced → Remote installation. From the Installation packages shortcut menu, select Properties. In the General section, enter the Administration Server address in IP or FQDN format. An error will no longer appear when connecting to the Integration Server (VIIS) as a result of an incorrect address.